sometimes my website which is hosted by blogger does not open and gives 404 error.. what should i do fo that?? Not to worry.That happens rarely due to server error or internet connectivity. If you find any issues related to broken links and wrongly typed URLs, follow the method as it is in the post. 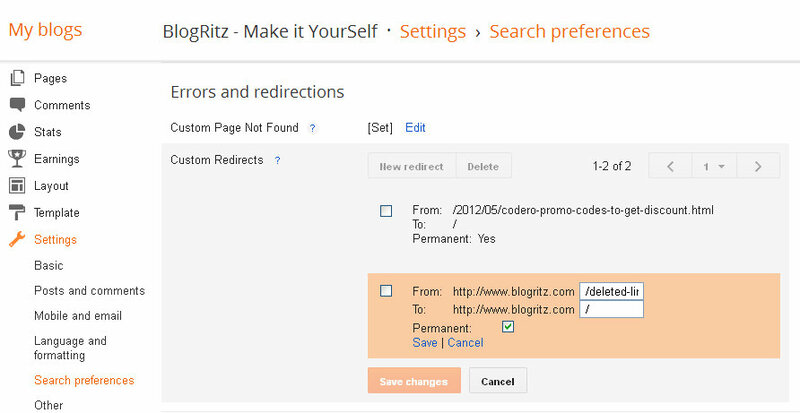 If I redirect broken url, should I use permanent redirect? No normal redirect? Permanent redirection (301) is the best way to fix broken links. Thanks friend! Sorry for asking this out od topic question. How to use canonical tag for fix blogger duplicate title tag issue? Again thank friend your help. is there a way to set up ONE Page Not Found redirect that will redirect to, or open the same post or page (eg homepage) to fix ALL 404 Page Not Found Errors? in Search preferences, Errors and re-directions? that would not display the error message even for a split second? Deleted or removed URLs can be redirected to any page that you want, but it is not possible in Blogger to handle all misspelled URLS. In 404 page you can put home link that helps visitor to reach homepage. CSS are only used for styling purpose. It may possible with server side programming. We don't have that facility in blogger,so not possible in Blogger. thanks for this post. but i am looking for a way to redirect my http://dailyhealthylifestyletips.com to http://www.dailyhealthylifestyletips.com. pls, i need your help. For some reason my 404 has quit working... It just goes to a regular blank page (with header, sidebar, and everything else). I'm not sure when this changed but when I try to enter in a new 404 custom text, nothing changes. Any ideas? "We have not been able to verify your authority to this domain. Error 12." Thanks so much. i did it for my new blog. my old blog was stolen. lol. guess i didnt pay on time after it expired. i had to start all over again. hello there, I want quoteluscious.blogspot.com to redirect quotely.blogspot.com, can these be possible? I finally fixed my websites problem. Thank you very much for having this post that I find to finish my website problem. I copy past the whole code, but only the default 404 page shows up. Please what do you am not getting right?